Posted by Jon in McFarlane Toys, Review, Video Games with 0 comments. The universe sure has a way of listening to my concerns and then acting exactly in the opposite of my wants and needs. In my previous review, I had mentioned that all of the trigger fingers being located on the left hands of McFarlane Toys’ Fortnite figures was getting old. I wanted a little variety. Well, somebody heard my complaints and their solution was to remove trigger fingers altogether. Yes, right off the bat both Drift and Rex in the new wave of McFarlane Toys Fortnite figures do not have trigger fingers at all. I wanted MORE hands, not less functional ones! I’m probably going to try and cut the pointer finger free and see if that solution works. There is also going to be some cutting needed to make Drift a more functional figure, but I’ll get into that when I tackle his review. Rex is a guy in a Tyrannosaurus Rex suit. I just wanted to make that clear. He includes a rocket launcher, “Scaly” back bling, “Bitemark” pickaxe, and a figure stand. Sadly, although the Bitemark pickaxe is modeled after one of those trigger-activated biting dino sticks, it doesn’t actually have an articulated jaw. At least they left the inside of the dinosaur head hollow, so it gives off the illusion of articulation. Overall, the paint is pretty good. There are a few noticeable slop spots, especially around the chest, belt, and scarf. He has a face under his Rex helmet, but the helmet can’t be removed. The reuse on this figure is fascinating to me. The entire body is essentially the prior wave’s Skull Trooper with just a few minor differences. For instance, from the waist down he is exactly the same except for a tiny flap sculpted into the top of each leg meant to circle around his crotch. If I was playing backseat toy engineer, I would have just used paint to add that detail. But instead, they actually tooled a new upper leg for that tiny little change. The chest is also very similar to the Skull Trooper’s, but the scarf isn’t a separate part now. They could have just cut the dog tags off and ended up with similar results. Finally, the arms have grooves cut in the middle of them. This is just a very odd case of the tooling having so little change that I’m amazed they didn’t just try to add the detail using the paint. 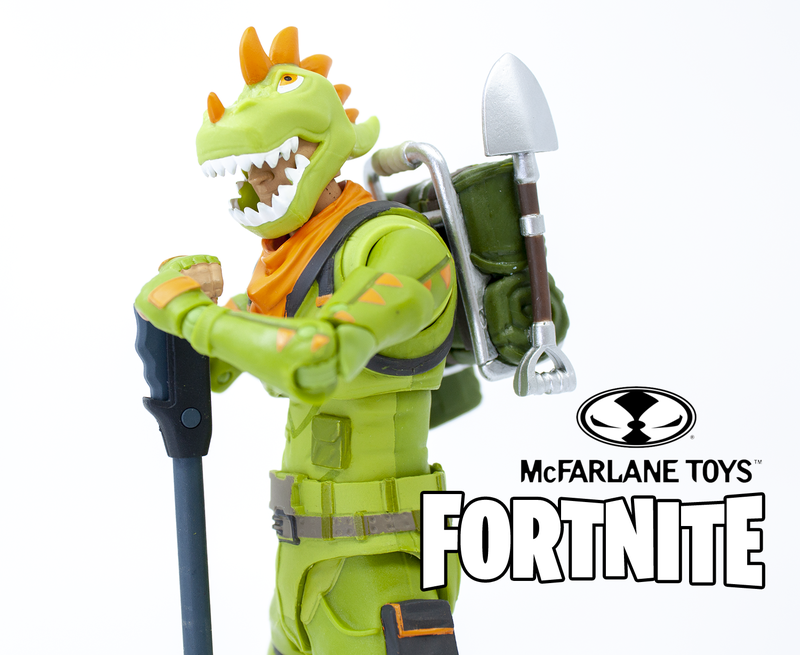 Would I suggest McFarlane Toys Fortnite Rex? The lack of any trigger fingers with this toy is the first real big misstep they’ve taken with this line. I still recommend him because otherwise, he’s fine. And who wouldn’t want a dude dressed up as a green and orange Tyrannosaurus Rex? Rex is currently up for preorder at Amazon. Entertainment Earth has Rex and a large array of Fortnite stuff as well. It looks as though we can expect these to start shipping and hitting shelves at the end of February 2019.